In a world that is so filled with tips, suggestions, recommendations and people saying you have to try this and you have to buy that… feeling overwhelmed is SO common that we’re almost numb to just how overwhelmed we are. That’s why today, I want to give you the 1 tip that has allowed me to feel confident breastfeeding for as long as I’ve wanted to. I have learned so much about breastfeeding over the last 6+ years that I have been breastfeeding that giving you one tip is a bit challenging. 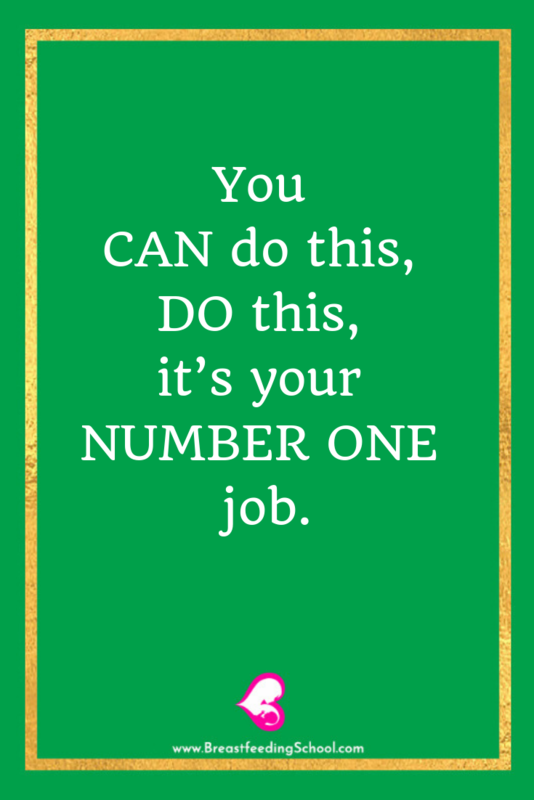 You can do this, do this, it’s your number one job. Why would I emphasize this section of my #1 breastfeeding tip? Because while I am your breastfeeding cheerleader, I know that the people who have motivated me when I was unclear about whether or not I wanted to do something weren’t the ones who said “Yay! You can do this!” While that’s nice and all, sometimes we need something more. You need something that can move the needle between being doubtful, and being certain and convinced that you want to take on another goal. Those people also weren’t the ones who said “Do this.” That’s concrete and to the point. But personally, as a sensitive being what I need oftentimes is a why. 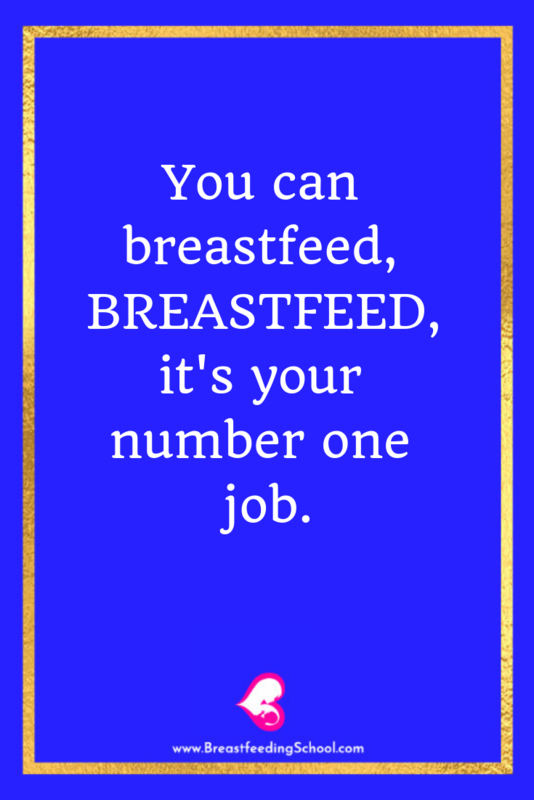 So the “It’s Your Number One Job” part of my #1 breastfeeding tip feels more powerful. More weighty. More convincing. More true. It defines the priority. It’s where the rubber meets the road. It’s so undeniable that it’s easy to want to rebel against it. And many women do. Therefore, realizing that breastfeeding IS your number one job is the first stepping stone to finding your personal why. So while I can understand that you don’t necessarily appreciate a stranger like me telling you that breastfeeding is your number one job, I am doing this with respect, and kindness, and speaking on behalf of your child that Life gifted you. Not so you can cop out on your first responsibility, but so that you can serve him/her. YOUR BABY’S wellbeing, THEIR health, THEIR opportunity to thrive, THEIR ability to feel nurtured by you is THE most important thing. 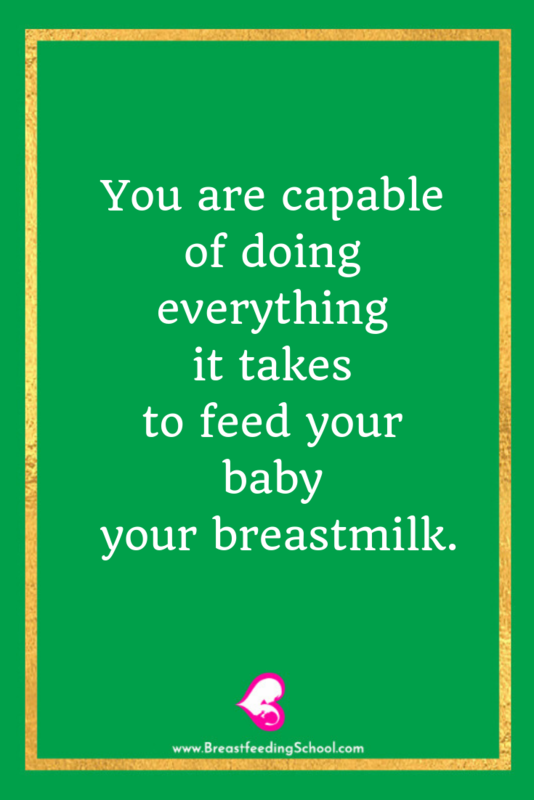 You are capable of doing everything it takes to feed your baby your breastmilk. So do everything it takes. Why Is Breastfeeding Your Number One Job? Just like if you were gifted a plant and you lived alone it would be YOUR job to water the plant…. when you’re gifted a baby, your main job is to feed it. To keep it alive. To nourish it. To cultivate it. To take care of it. YOU are their food source. That’s the way NATURE (not me) intended it to be. Before formula was created, it would have been MUCH easier for you to understand this. But now, with the availability of formula, you may equate formula as an equally wonderful choice as breastmilk… but in MOST instances, formula is NOT inherently the best choice BECAUSE its COMPOSITION isn’t the best. Would you like to have a natural apple picked from an apple tree… or a round red thing that has become a lab-created substitute of an apple? I am pretty sure we could all agree that we would prefer a natural apple. So if we KNOW wheat’s natural and what’s synthetic… why would we want to give our baby, our most precious thing the synthetic choice? Are There Moms Who Are “Exempt” From Having Breastfeeding Be Their Number One Job? Maybe. 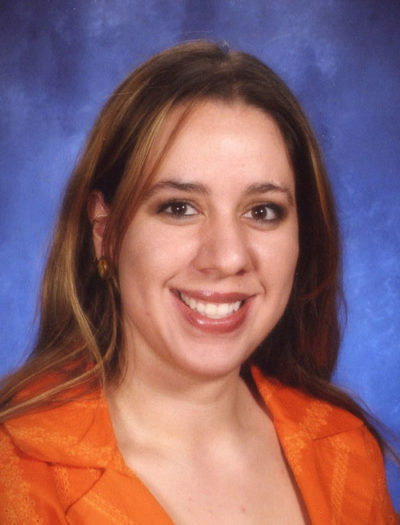 I get it that some moms may have postpartum depression and other medical health concerns. That’s why I emphasized above that in MOST cases, breastfed is actually best. Sorry to disappoint you or upset you if you feel that it’s not. And let me just say that OF COURSE keeping the baby alive no matter what it takes is the #1 priority. What I’m simply saying is that if you can breastfeed… (and the VAST majority of you, along with the VAST majority of other women CAN)… breastfeeding your baby is your number one job. Hopefully, you’re here with me, and you haven’t stopped reading this despite any people who might have left because I am being so real with you, you are at least open to what I’m saying. After all, I’m giving you this as PART of my #1 breastfeeding tip not to impose my beliefs in you but to help you. When I say that breastfeeding is your number one job…. this is not because I said so. Nature designed it that way. But of course, I understand and respect that you have free will. Nature understands and respects this, too. Nature also intended that your children call you mom. If you want, you can call your daughter mom. But that’s not the way nature intended it. I’m just reminding you how nature intended it to be. And while yes, we live in a modern world… no amount of jobs, cellphones, technology, reality shows or whatever is going to eliminate this truth. Nature didn’t give the baby’s father the breastmilk for him to feed the baby. Or the grandma. Or the sister. Or the mayor. It gave the breastmilk to YOU. YOU have that treasure. YOU have the personalized meals that your baby needs— breakfast, lunch, dinner and a whole bunch of snacks for years to come. And it’s not only their food. It’s their first line of defense against illness. And while of course you can pump your milk (I think pumping is cool) and have someone else feed it to your baby, you are the one who has to make the effort to either breastfeed the baby directly or pump your breastmilk. Nobody else can do that for you. And if you DON’T put in the effort to somehow, someway feed your baby your breast milk… guess what? You have a symbiotic relationship with your baby and your milk. You depend on one another to be well and have an abundance of breastmilk to offer. Even though your baby is a baby, he/she plays a HUGE role in there being plenty of breast milk to feed them. But of course, when they’re newborns, they’re not going to walk or crawl to you to keep the breast milk production going. You have to offer your breast. When I say that breastfeeding is your number one job…. instead of pressuring you into breastfeeding, what I’m ACTUALLY trying to do (aside from educating you on the VALUE of breastfeeding) is to give you RELIEF. I started this post by sharing that we’re already overwhelmed. That we’re pulled in so many directions. That we have so many distractions. That we can learn about so many different suggestions. So when I tell you, breastfeeding is your number one job… know that I want to help you let out an “ahhhh” and help you understand that the dishes can wait, mopping can wait, vacuuming can wait, cleaning the bathroom can wait, doing the laundry can wait, many, many, many things can wait. And if you let that sink in, breastfeeding will be more pleasant. More manageable. It’ll be the ONE thing you have to focus on. And all of a sudden, the whole idea of breastfeeding won’t be so overwhelming anymore. Because most ladies think I have to do EVERYTHING that I regularly do AND breastfeed. And the answer is no. It doesn’t work that way. You have to drop other things from your perpetual to-do list and focus on you and the baby, and feeding them. Many of the other things can wait. And let me just say that while these things matter to some degree… in the grand scheme of things, they matter less than you think. Because, YOU, my friend are the queen of this breastfeeding castle. Which means that what you say goes. The things that I listed above and that you can’t control SHOULDN’T be your main focus. You can only control what you can do. I’m telling you RIGHT now. you CAN breastfeed. You can breastfeed, breastfeed, it’s your number one job. But just in case you need more than my words to be convinced that you can rule successfully, statistically speaking, more than 95% of new moms can (and should) breastfeed. So that means that it doesn’t matter whether you’re at stay-at-home mom, a work-at-home mom or a mom who works outside the home…. you CAN breastfeed. No matter how perfectionist or Type-A you are, when you’re breastfeeding, realize that being there feeding your child is THAT important. Yes, if you can, you can try to multitask and try to check off other things off your to-do list that are bugging you from the comfort of your nursing chair, or maybe while you breastfeed your baby from your baby carrier (yep, that’s another breastfeeding tip). But everything else that you accomplish for at least the first 6 months or so after your baby is born, will be extra. Don’t overwhelm yourself with a long to-do list while you’re breastfeeding. You’re keeping a human alive, and healthy and connected to you. It does, of course. So give yourself some much needed grace. Rock that breastfeeding throne with glee. Are You Still Doubting Yourself And Questioning If You Have What It Takes To Breastfeed? 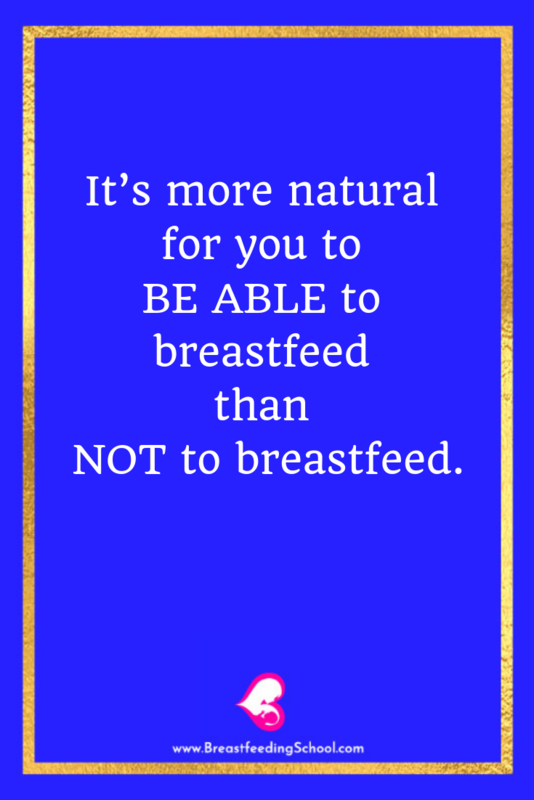 It’s more natural for you to BE ABLE to breastfeed than NOT to breastfeed. In other words, it’s more natural for you to BE ABLE to breastfeed than NOT to breastfeed. Let that sink in for a minute, or more. Oftentimes, we are fast at remembering all of our excuses for why we’ll fail, but we forget to acknowledge all the reasons why we’ll succeed. And the premise that it’s more natural for you to be able to do this than not do this applies to practically everything in life. But just like good investors invest into or reap benefits from the stock market even when the market is high or the market is low, invest YOUR TIME into the things that are truly worth it. Like your child. Your time, as you know, is one of the most valuable assets you have and that you can give to your child. You were anticipating your baby’s arrival and you’re happy that they’re here. Make them happy that you’re there… by their side. Hopefully, by now you’re starting to truly see the value of breastfeeding. But now, you have more questions and curiosities. How Can You Increase Your Chances Of Breastfeeding? Moms often ask how they can increase their chances of breastfeeding. 1) What I’ve said before— You can do this, do this, it’s your number one job. 2) It’s natural. (But of course, it has a learning curve, but I’m here for you). Once you have those two things really ingrained in you, then you understand that not only CAN you overcome any obstacle that comes your way on your breastfeeding journey, but you WILL. Not to be facetious but, I don’t care and I don’t think YOU should care very much about what the average mom does. 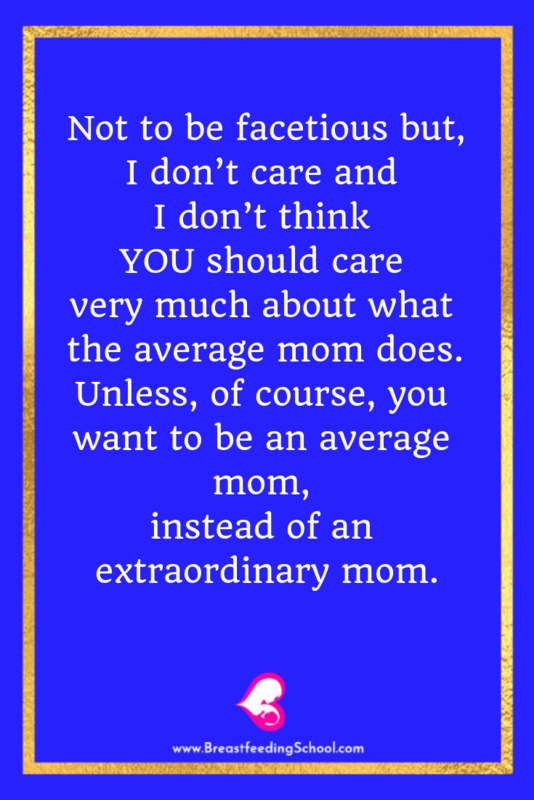 Unless, of course, you want to be an average mom, instead of an extraordinary mom. So when it comes to the question about how long the average mom breastfeeds, my simple answer is as long as she wants to. Don’t set YOUR own breastfeeding goals on when people abandon their breastfeeding goals along the way, base them on how long you want to provide the most beneficial, optimal and tailored nutrition to your baby. Because many moms set a low bar for themselves. Many don’t start breastfeeding, many breastfeed for a few weeks, and many stop breastfeeding by 6 months. But the experts say you should breastfeed for longer… at least 2 years. 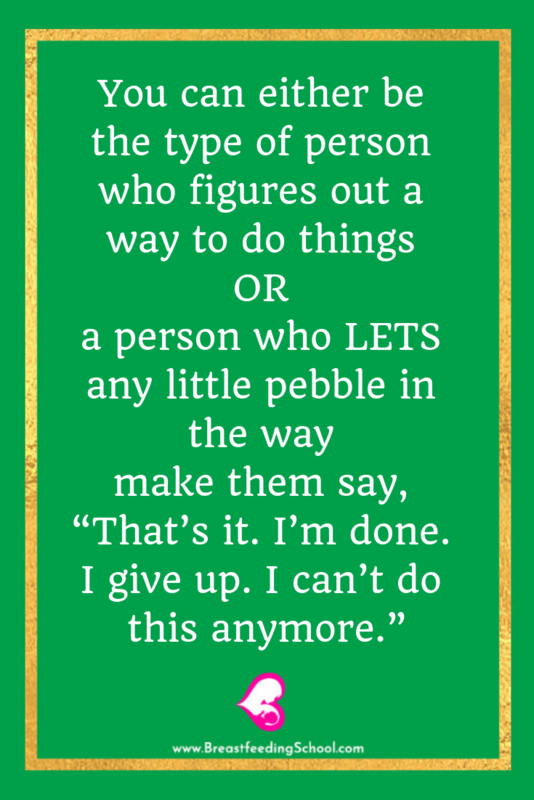 So now that you know this… do you notice how you’re tempted to either go with the people who aimed low? Hopefully, you see the value of the experts and know that breastfeeding for at least 2 years is the best thing to do for your baby. And you’re ready to jump in… and breastfeed your baby long-term. You Know What The Best Thing About Deciding To Breastfeed Is? That with new moms, there is an even playing field. On the day your baby is born you can start breastfeeding 🤱. Boom chakalacka. There is no catching up to do. Of course, education will help you be better prepared to breastfeed, but all new moms, regardless of how much or how little they know about breastfeeding have ONE thing to do. And the decision to breastfeed is a decision that has to come from your heart. And thankfully, it isn’t dependent on whether your mom breastfed you, whether you saw your mom breastfeed your siblings, whether your best friend has breastfed, etc., etc. You can decide right here right now if you’re in. Or if you’re out. And if you decide that you’re in, (first of all high five!) … you’re already doing great. You’re making the best choice. You’re right on time with this date with destiny. If you’re worried you haven’t bought the breastfeeding products you miiiight need, visit my Breastfeeding Resources page. See what you personally might need and buy it. Done. You and your baby is what you need really need. But if you’re wondering what breastfeeding item you need first, know that the Boppy is my favorite breastfeeding item. So if you buy just ONE thing let it be that, because it’ll be like a helping hand that will literally cradle your baby and will more easily achieve your breastfeeding goals. You can always go back to the Breastfeeding Resources page and buy the other things you feel you need. But know that you already have the vast majority of what you need— it’s inside your heart- and it’s the generosity that you have to be willing to share literally of yourself to your child. I believe in you. I really, really, really do. It’s natural to breastfeed, remember? Your baby believes in your ability to breastfeed, too. As a matter of fact, they expect that you breastfeed. Are you going to let them down? I hope not. Give yourself the gift of achieving your breastfeeding goals. Do this for you and your baby. And regardless of the amount of time you breastfeed or give this breastfeeding thing ALL you got. There are no job performance reviews in breastfeeding, but you will see how well you’ve done based on the health, strong bond and high IQ of your child. Your efforts will be increasingly worth it as you see them grow and thrive. Ultimately, following my own advice has been what has allowed me to breastfeed for over six years. I can do this. I have done it and continue to do it. It has been my job. And truly, out of all the jobs I have had and could have, it has been the job that has given me the most pride and joy. Feel free to read 5 Reasons I Love Breastfeeding. Regardless of what your ultimate decision to breastfeed ends up being, you have value and your baby has value. Would You Like Additional Breastfeeding Tips? If you’ve gotten to the end of this post with an open mind, an open heart and an even stronger desire to breastfeed than when you started reading you’re EXACTLY the type of mom whom I would love to help on this breastfeeding journey. I would LOVE to have you join my FREE breastfeeding program called Breastfeed Your Baby Successfully. You can sign up by visiting here. Are you a breastfeeding mom? What is your #1 breastfeeding tip? If you’re embarking on your breastfeeding journey, what was your biggest takeaway from what you just read?